Choosing a laptop for a senior citizen can be a daunting task. Seniors have a wide variety of needs when it comes to computer use. Some are very comfortable with modern computing technology and may be ready and willing to jump in with any number of laptop powerhouses, while others may be quite uncomfortable or even feel a sense of panic when they think about spending time with a laptop. Luckily, the process of choosing a laptop doesn’t need to be painful. If you are a senior citizen looking for a laptop, or a younger individual looking to help an elderly person choose their device, keep reading to find out how to pick the best laptop for your needs, as well as an overview of our Top 5 picks. It’s time to take a look at some great options when it comes to laptops for seniors! Our #1 Pick for best laptop for seniors is the Dell Inspiron 15 5000 . This laptop is a great pick, powerful enough to meet the needs of most seniors at a decent price. In terms of functionality, the Inspiron has a lot to offer. This model comes complete with a RealSense 3D webcam and excellent speakers, to support hours of Skyping and staying connected with friends and family. There are three USB ports for peripherals such as a mouse or extra storage space and an optical drive for viewing and burning CDs and DVDs. In terms of portability, this laptop weighs in at 5.36 pounds, on the heavier side of our recommendation but still quite manageable. The battery lasts between five and six hours for the average user, more than most seniors will need in one sitting. This laptop features a 15.6-inch screen, large enough to aid vision but still small enough to make the laptop easy to move around and manipulate. It displays at Full HD with excellent clarity for a comfortable viewing experience. When it comes to processing power, the Inspiron has enough to cover the needs of most seniors, with a sixth-generation Intel i5 CPU and a full 8 GB of RAM. These are well above our minimum recommendations, at a great price for what you get. Overall, the Dell Inspiron earned its place as our top pick because of its fantastic performance in each our areas of consideration and based on excellent user ratings. The Dell Inspiron may have made it to the top as our exciting first place pick, but it’s not the only great laptop for seniors on the market! Let’s look at four more great choices to round out our top five list. Our second place pick is the HP 15. This laptop offers a great collection of features that seniors will find useful. The HP 15 has plenty of advantages when it comes to functionality. For starters, it has an HD webcam and dual stereo speakers. Like our number one pick, it offers three USB ports for extending functionality and a DVD drive. Seniors will get plenty of use from this laptop thanks to this well-rounded set of features. This device weighs just 4.73 pounds, making it nicely portable. The battery can last up to 7.5 hours, although this number varies significantly depending on how the laptop is used. Still, overall this laptop has a lot to offer if portability is an important consideration. With a screen size of 15.6 inches, the HP 15 is another example of excellent balance between viewing experience and portability. The beautiful Full HD display is well regarded by many users. This laptop also has great support in terms of processing power. It comes with an Intel i5 processor and 8 GB of RAM, so most seniors are unlikely to deal with lag very often. In the end, the HP 15 is another excellent choice for seniors, and very nearly beat out our #1 pick. It placed second because the webcam and speakers couldn’t quite measure up to those on the Inspiron and because of inconsistent reports regarding battery life. However, overall this is a fantastic laptop with lots to offer. Third on our list is the Acer Aspire. This device is not quite as powerful as our first and second picks, but still beat out many laptops in our comparison to hit the top five list. The Aspire brings you an HD webcam and speakers designed to provide quality sound even at a distance. There are several USB ports and an optical drive built to last. This device weighs a reasonable 5.3 pounds and has up to 12 hours of battery life. Most users report that the laptop’s battery life reputation is well-earned, with an average between 7 and 12 hours depending on use. The screen size on this laptop is another beautiful 15.6 inches of Full HD display. Processing power is not quite as strong as our top two picks, with an intel i3 processor and just 4 GB of RAM. However, this level of processing power will still be sufficient for most seniors. The Acer Aspire is another great choice for seniors. This laptop came in third due to its reduced processing power, but it will still support the needs of most seniors and offers a great portability profile with up to 12 hours of reliable battery life. HP scored well with two laptops making it onto our top five list. This manufacturer has many great options, but the HP 14 caught our attention for fourth place because of its excellent value. If finances are a concern, this laptop is well worth consideration. This device includes a webcam and speakers, as well as a single USB port. It doesn’t include a DVD drive, but losing the drive means gaining portability. At just 3.9 pounds with 4-6 hours of battery life, this device is quite manageable for those in need of a laptop that’s easy to move around with. 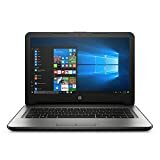 Just like other 14 inch laptops, the HP 14 offers a screen size of 14 inches, smaller than some but still large enough for comfortable viewing. The screen is Full HD and users report positive experiences with both image quality and viewing angles. In terms of processing power, this laptop offers an AMD E2 CPU and 4 GB of RAM, comfortably within our range of recommendation. On its own, the HP 14 is a great choice. It came in fourth on our list due to somewhat less competitive processing power and a smaller hard drive—just 32 GB—than our top three picks. Even so, this laptop will serve you well for the use cases most common to seniors, especially if you’re on a budget. Our final pick takes your options in a different direction. The ASUS Chromebook is less powerful than our other picks, but has unique features that make it ideal for many seniors. In terms of functionality, this laptop has all the most important features we’re looking for, including a webcam, decent speakers, and 2 USB ports. This device also has something unique to offer over the other laptops on our list: it’s been ruggedized to make it stronger in the face of drops, bumps, and spills, with a rubber casing, easy grips, and a spill-resistant keyboard. If your senior suffers from shaky hands and may be at risk of dropping their laptop, this device might be your best choice. Portability is an area where the Chromebook also really stands out. This laptop has a smaller screen than the others on our list at just 11.6 inches. This is perfect for those who value portability and don’t need a large screen size. The battery will last you for up to 10 hours, and this device is very lightweight at just 2.65 pounds. This device isn’t for everyone. Like many Chromebooks, the ASUS is quite limited when it comes to processing power and storage space. With an Intel Celeron processor, 4 GB of RAM, and only 16 GB of flash storage, seniors won’t be doing any heavy lifting with this device. However, the Chromebook is particularly well-suited for those who use their laptop to surf the web, check their email, edit documents, video chat, and who don’t need a lot of storage space. It’s also very well suited for those who are a little rougher on their laptops, want the extra ruggedization and who place a high value on portability. If this sounds like you, the ASUS Chromebook is an excellent choice at a fantastic price. There are some special considerations to keep in mind when choosing a laptop for seniors. Elderly individuals are often less familiar or comfortable with laptops. They may experience difficulty with vision, hearing, trembling hands, or stiff fingers. They may also use their laptops for different overall purposes than some of their younger counterparts. We determined this final list by carefully researching user reviews and gathering input from those who work with the elderly. The most important consideration when choosing a laptop for seniors is overall functionality. You might think this is a no-brainer—of course the most important feature is functionality! What good is a laptop that doesn’t do its job? However, when it comes to seniors it’s particularly important to keep in mind just what they plan to use the laptop for, and make sure that the laptop functions in regards to those particular needs. A well-intentioned individual from the younger crowd may start looking for a laptop for an elderly family member and become excited by things like impressive processing power—an important feature for many people, but one that may not have as much relevance for seniors. Laptops have become an integral part of life for many people, including many elderly people. Senior citizens commonly use laptops to keep in touch with family, take care of bookkeeping tasks, browse the internet, organize digital photos of friends and loved ones, and make use of their email provider. Portability is another important consideration when choosing a laptop for seniors. Many seniors deal with shaking or trembling hands, arthritis, or muscle weakness the older they get. 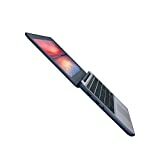 In these situations, a laptop that is overly large or heavy can be burdensome and easily dropped. Battery life is another issue, as senior citizens may find it more trouble to have to get up and down frequently to charge the battery. To get the most comfortable experience with your laptop, choose a device that weighs no more than six pounds. We recommend a screen size of not more than 17 inches, unless vision is an issue in which case you may wish to consider a larger screen. In terms of battery life, it’s best to choose a laptop that can go at least four hours without needing a charge, and the longer the better! We’ve already mentioned the importance of not choosing a screen that’s too big. But what about a screen that’s too small? It’s true that smaller screens are more portable, and you may decide that this is an important factor in choosing the best laptop. However, many senior citizens either struggle with impaired vision or, like all of us, will struggle as they get older. For this reason, it’s best to go for a laptop that is large enough to be viewed comfortably, without creating headaches or eyestrain. We recommend picking a laptop with a screen size between 14 and 17 inches. Laptops in this range are large enough to provide a good viewing experience for most seniors, but small enough to avoid becoming cumbersome. With this in mind, don’t be afraid to go smaller if you feel that portability is a more important factor. Laptops and tablets in the 10-14-inch range can have a lot to offer as well, provided that you don’t suffer from eye problems. When it comes to laptop screens, size isn’t the whole story. You also want to think about the quality of your laptop screen. Make sure to choose a screen with good resolution that won’t cause unnecessary eyestrain with prolonged use. A screen with at least Full HD resolution (1920 x 1080 pixels) is your best choice. A final feature to keep in mind when choosing a great laptop for seniors is processing power. Seniors often use their laptops for less demanding tasks than, for example, gamers or graphic designers. Spending money on high-powered CPUs, double-digit RAM, and dedicated GPUs is usually not necessary. However, that doesn’t mean that anything goes. Seniors want to their laptops to run smoothly and efficiently just as much as anyone. It’s important to choose a quality processor capable of streaming video without interruption and navigating tasks without lag. We recommend choosing a laptop with a good AMD or Intel i3 (or above) CPU. You’ll need at least 2 GB of RAM, but probably not more than 8 GB. After a great deal of consideration, the Dell Inspiron came in as our #1 Top Pick for best laptop for seniors. This laptop earned its place thanks to an exciting combination of functionality, portability, processing power, a great display, and a reasonable price. If you choose this laptop for seniors, you won’t be disappointed. Although the Inspiron placed first, the other four laptops on our list each have something to offer. From the Acer Aspire to the ASUS Chromebook, each is suited to different use cases, and you may find that one of these excellent choices is best for your personal situation. Armed with the information in this review, you’re ready to move forward and make a great choice for best laptop for seniors! The best laptop for seniors is one which is easy to use, has a large screen and a comfortable keyboard. We take a look at the best five and choose a winner. Thank you so much for this article! I am a 66 yo retired nurse. I own an acer aspire 5315-2698. It is 13 years old. It has been a good pc but now it has gone over the hill. I can no longer get updates, it crashes suddenly when i am on a website, when typing an e-mail message the letters suddenly move to another place. 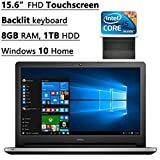 I am not computer savvy so your expertise will be very useful for me in buying a new computer. Thanks again!